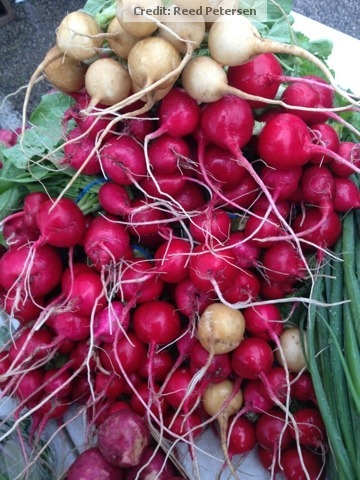 Radishes are mistakenly thought of as a “flash in the pan” spring crop. This once and done mentality deprives the radish lover of some delightful summer and fall crops. The key to a continuous supply is to succession plant. Only plant what you will use in a week or two, but plant more radishes every two weeks. If you don’t use them when they are ready, pull them and put them in the compost pile, then plant some more. In the heat of the summer radishes can become more strong flavored and pithy (woody). A rich environment (lots of compost) that is well weeded and has a steady supply of water, will keep this heat to a minimum. We have had radishes as large as a tennis ball be very nice and not a bit woody using this approach. Fall is another time when radishes really shine. You can plant and harvest until freeze up. I’ve mentioned in the post on How to Grow Organic Carrots that radishes can be planted at the same time as carrots and harvested as the carrots are emerging or still very small. They essentially become an edible row marker and protect the carrots for a week or two. Never under estimate the micro climates that a crop canopy can create around the plant. Radishes can shield the very fragile carrots at a time when they are vulnerable. Cherry Belle is a good standard radish. We have tried some other varieties with good success. Since they are typically 20-25 days to harvest you can try several varieties in a season.